How Much Internet Speed do I REALLY need? These days, there is lots of talk about Internet speed in the press, and there is considerable interest in building faster networks. Over the next few years, technologies like DSL Bonding and Vectoring and Fiber to the Home can be expected to open up options for faster and faster connections, leaving you with a decision to make – how much Internet speed is enough? 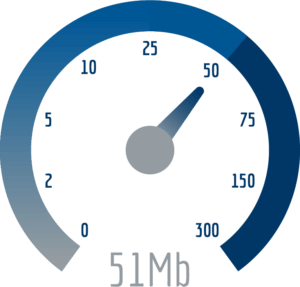 Determining how much Internet speed you need is a straightforward calculation, but it involves many factors. You’ll need to consider the total number of Internet users, the various on-line activities they engage in, the bandwidth necessary for those activities, and how many of those users will be using the Internet simultaneously. The hardest part may be figuring out how much bandwidth each activity really uses. Lastly you’ll want to think about all the other devices in your home that connect to the Internet and how they use those connections, such as TV receivers, game consoles, smart appliances and more. Streaming is a type of download that isn’t saved or stored anywhere on your devices – you view or listen as it is continually streamed from another storage location. Streaming only uses enough bandwidth to actually watch a video in real time – you don’t have to download the whole video all at once. Downloading is the actual transfer of the data from one place to another. When you download a movie or a song, get email, or search and save from the web, you have a copy of the item on your device. Downloads typically use more bandwidth over a shorter period of time that streaming, because if your Internet speed allows it, you can download faster than you can watch. Uploading is similar to downloading; whatever you send is copied to another device or location. The biggest way most homeowners use bandwidth is streaming or downloading entertainment content like movies and music, but there are other key uses as well. A 2-hour movie is about 2 gigabytes of data, and with 4 Mbps service it would take about an hour and 15 minutes to download. By increasing your Internet speed, you simply reduce the amount of time it takes to download the content. That same 2-hour movie would take half the time to download with an 8 Mbps connection. Streaming is a bit different. According to Netflix, for streaming a movie, you need somewhere between .7 Mbps to 5.3 Mbps. High quality audio and video will require more bandwidth or speed in order to stream properly. Based on Netflix calculations, for the best quality streaming Hi-Definition (HD) video, you’d need more than the basic 4 Mbps down. However, non-HD best quality streaming could be achieved with a 4 Mbps connection. Streaming music is far less taxing on an Internet connection as it requires about 2 Mbps for the highest quality audio. Regarding e-mail, estimates are that an average email without attachments is about 75 kilobits, which is 0.075 megabits, in size. An e-mail with a file attached increases by the size of the file. Bandwidth usage estimates for on-line gaming are around 150 Mb / hour or about 1/20 Mbps. The real culprit is the usage for updates to the games and that can exceed 100 Mb for each update, or the audio calling services gamers use to talk to one another. For a 2-way video call, Skype recommends 0.3 Mbps as a minimum upload and download speed. Facebook users average about 0.03 Mbps when browsing the site, but requirements increase significantly when streaming videos from the site. Remember, this is just one calculation for a hypothetical four-person household, and your own calculation could be very different. If you’re using satellite or cable TV in conjunction with Internet services, for example, you may be using a lot less bandwidth for viewing online video. It’s important to note that the bandwidth estimates for phones and other devices is when they are IDLE. Should they update or send/receive other data, they will use more bandwidth.